Sorry for necrobumping, but download link is dead and I cant find it elsewhere. Thanks for any help. EDIT: Wow, that was quick. Thanks. 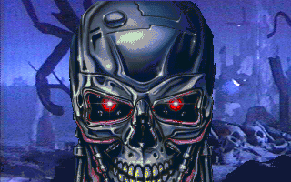 Has anybody found way to play SkyNET with hi-res mode fast and reliably in DosBox? I tried all major variants of it, experimented with different cpu and video settings and still couldnt achieve any satisfactory results. BTW am I the only one who cant stand that bright blue sky from SkyNET? I dont understand why Bethesda altered it, it is quite atmosphere breaker. Out of curiosity, I've already taken the "Let's rock!" from World Tour, reduced the quality to try to make it identical to the original, but there's still a substantial difference between the two recordings. Can we hear it too? No offence, but I wish for exact opposite. Just let them stick to vanilla limits. Because if they will come up with new things, they certainly wont be standartized. And that will only lead to fragmentization of modding/mapping community.